We are in our last week of school – yippee!! I wanted to finish off our year with some fun, educational activities, so yesterday we spent the day learning with gummy bears! First we estimated how many were in the bag, and which color had the most and least. Then we sorted, made tally marks, and graphed our results. 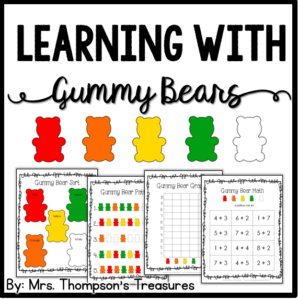 We also practiced patterns, adding and subtracting, and measuring with gummy bears. 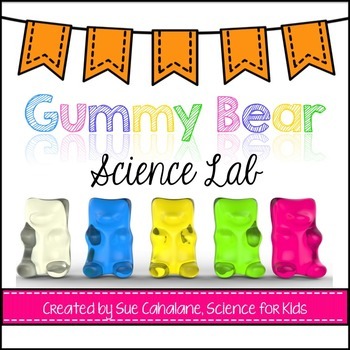 Finally, we did an experiment where we put 4 gummy bears in different solutions to see what would happen. We talked about the scientific process and I introduced them to big words like prediction, hypothesis, and conclusion. It’s never too early to learn the scientific method! We let them sit overnight and made observations in the morning.